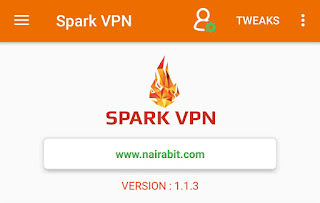 Hello guys, it's been a while now since I posted new article on nairabit about MTN free browsing, because it's still Blazing on http Injector and eproxy VPN/SSH tunnelling apps. Today I will be adding Spark VPN apk app and Spark VPN config file (.svc) for latest MTN free browsing cheat for October and November 2018 on both MTN mpulse cheat and MTN 0.0k cheat. What is needed for spark VPN mPulse and MTN 0.0k cheat? Updated Spark VPN config file. Tap on "tweak" at the top right corner of the app and navigate to the folder you downloaded the .svc config file, then tap on it to import. Finally, tap on the config file of spark VPN and import it. Tap on the start button at the bottom of the app, wait for a few seconds for the app to connect and voila !